To make the next push into the expansion of ROK II I've decided to launch a 31 days crowdfunding campaign through Indiegogo starting today. I wanted to start one on Kick-starter but unfortunately my location is not in their reach so we go with Indiegogo for now. Please read through the campaign, what is being offered, the available perks, etc. Yes, I am continuing to update ROK all the time, but to do it at a faster pace and not years with a bit here and there then I really need far greater support. Please also pass this on to those you may know who have the monetary clout to back something like this as so many can benefit. Reading and writing promotion groups may also be interested. Thank you. Ready to Back Us? Start Here! It was suggested that I should add FP bonuses to the Perks as an incentive since that is what they would get if someone donated through our regular system. Therefore, I've added FP plus a bonus and one additional Perk. Become a Backer: Ruler of Kings Crowdfunding! Looks like one Backer donated $25 so far via Indiegogo. We got a huge donation $1,010 from KNtoran Introduction - Page 121 contributed through our current Donation system here! One more backer and support listed from the Air Guns Community: Support for autism project. Thanks so much. To date there have only been $1,015 contributed towards ROK II. While that may sound like a lot it is only 8.6% of what is needed to create the parts mentioned in the Crowdfunding Campaign. One of the big challenges is letting everyone know the Campaign or ROK II actually exists. My hands are tied and can only do bursts of advertising when my boys allow me, so please help me spread the word. US$1,065 raised but a lot more is needed and only a couple of days left. Not reaching the goal will significantly slows future enhancements in both ROK II and the Community. 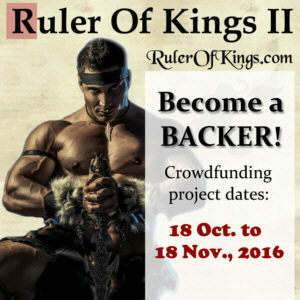 Become a Backer: Ruler of Kings Crowdfunding! I wish I could support more but I'm tight right now. I am curious though… what happens if you don't meet the amount you want to raise? What will happen with ROK II? I looked into backing but to be honest that is pretty large purchases. I would have been more into something a lot less like $20-100.